Your Office Stop Laminating Pouches and supplies are made to be compatible with all hot laminating machines, including models made by GBC, Techko, Brother, Duck, Monroe, Royal, Scotch, 3M, Design Concepts, Akiles, Fellowes, Royal, Royal Sovereign, and many other brands of hot laminating machines. 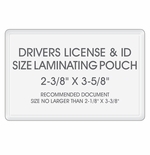 Our smaller size laminating pouches line-up includes business card, credit card, drivers license, bookmark, government ID, jumbo, military ID card, index card, file card, luggage tag, video card, photo, and half sheet laminating sheets. 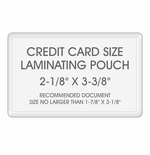 Unlike many other sellers of laminating pouches, we offer many of our more popular sizes in quantities starting at just 25 per pack, so you aren't stuck with a huge pack of laminating pouches you may not need. We also offer variety packs, so you get a nice mix of laminating supplies, and carry our more popular sizes in various MIL weights, including 3 MIL, 5 MIL, 7 MIL, and 10 MIL. 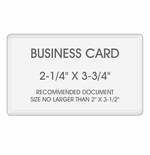 Small - 2-3/8" x 9" � Medium - 2-3/8" x 8-1/2" � Large - 2-1/8" x 6"
Recommended for items no larger than 2-1/4" x 3-3/4"
Recommended for items no larger than 5-3/4" x 8-3/4"
Recommended for items no larger than 2" x 3-1/2"
Recommended for items no larger than 1-7/8" x 3-1/8"
Recommended for items no larger than 2-1/8" x 3-3/8"
Recommended for items no larger than 2-11/16" x 3-7/8"
Recommended for items no larger than 2-1/8" x 3-5/8"
Recommended for items no larger than 3-1/4" x 5-1/4"
Recommended for items no larger than 3-3/4" x 5-3/4" and 4" x 6"